One of the ways that South Sudan has managed to avoid currency depreciation after its collapse in oil revenues, has been to impose hard controls on access to foreign currency. Instead of rationing limited foreign currency through price (to the highest bidder) - rationing has been at the discretion of the authorities. 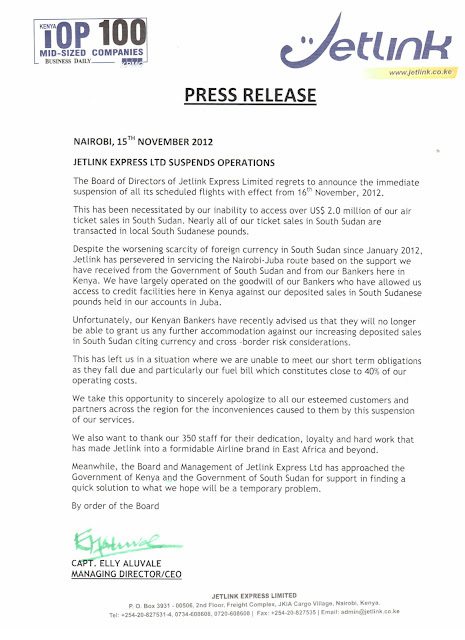 As a result, Kenyan airline Jetlink hasn't been able to convert its South Sudanese Pounds into hard currency with which to buy fuel, and has just announced the suspension of all of its flights. My name is Lindsey O'Connor and I am the Content Production Manager for the non-profit organization, Every Person Has A Story (EPHAS). We have programs across the developing world that help children tell their stories, and have those stories heard, through the power of photography and social media. Right now, we have a campaign going to bring Beb C. REYNOL, a prize-winning photo-journalist to teach for 5 months at our program in South Sudan, where South Sudanese EPHAS students have been, and will continue to, document the progress, challenges, turmoil and daily life in the world's newest country. We work closely with Emmanuel Jal, who is a big supporter of our organization: http://www.youtube.com/watch?v=WK2JYBj5-Jc. If you think this is something interesting, I'd welcome the opportunity to chat, and/or to connect you with Ryan Ansin, Executive Director of EPHAS.